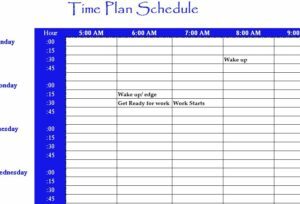 Simple and straight to the point, the Time Plan Schedule is a neat template, where you can watch your entire week unfold on one page. The document works as a simple time chart with the days of the week in the first column and the hours of the day at the top. This free sheet is the perfect tool to finally organize and fit all the things you’ve dreamed of doing into your schedule. If you’re tired of losing sight of your hobbies, special projects, or even work, you can now find the time with the Time Plan Schedule. To download the free Plan Schedule, simply click the link at the bottom of your screen. When the template is done downloading, click the file to open the Plan Schedule. As stated above, the days of the week are located in the first column and the hours of the day are at the top. You will start by changing the hours to fit your own schedule. For example, if you don’t have to be at work until 10:00 am, you might want to adjust the hours so you don’t have to list “sleeping” in any of the columns or have wasted space. Now you can start entering your daily schedule. The most common starting point is waking up and getting up, the rest is up to you. It’s best to lead by example. Let’s say that your first real item for the day is going to work on Monday at nine. You would scroll down the page to the “Monday” section and scan across until you’re in the “9:00 AM” column. In that cell that intersects these two sections, you will enter “Go to work”. Go through and fill out all the remaining sections with the rest of your weekly schedule. With this fully-customizable template, your schedule is exactly what you want it to be.